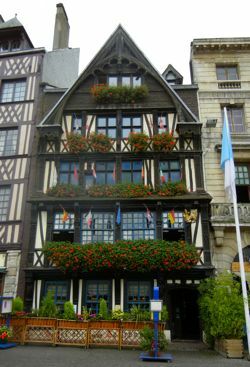 Despite its bloody past, the Place du Vieux Marché is today a lovely spot for eating, shopping, and people watching in Rouen. Rouen's Place du Vieux Marché, or Old Market Place, is best known as the spot where Joan of Arc was burned at the stake in 1431. The modern Église Jeanne d'Arc dominates the center of the Place, which also hosts a daily market (except Monday). Today the Place is also the centerpiece of a restaurant area, which includes La Couronne, best known as the restaurant where American TV chef Julia Child enjoyed her first meal in France—sole meunière—and was introduced to French cuisine. You'll find yourself drawn to the Place for a meal, or tea, or to get picnic goods, or to explore the interesting church. It's a great place for people watching as well, and just a short walk from the Cathédrale, the Gros Horloge, the Seine, and other points of interest. 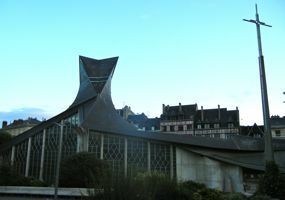 Above, The modern Église Jeanne d'Arc, in the Place du Vieux Marché, Rouen, where Joan of Arc was burned at the stake. Below, La Couronne, site of Julia Child's first French meal!